Getty Copper is a Canadian mineral exploration and development company committed to increasing shareholder value. Getty’s main objectives are to place its Highland Valley open-pittable porphyry copper deposits into production, and to discover and develop additional reserves, resources and deposits, through systematic exploration of the many targets on the company’s property. 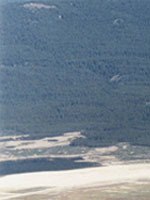 The Getty land position in the area contains approximately 269 square km (104 square miles), which is located immediately adjacent to the Highland Valley Copper Mine. This property includes the Getty North and South deposits, as well as, the Getty West, Glossie and North Valley mineral zones.